We were sent, the Rapid Fire, The Predator and the Flying bug attack. The 6-dart front-loading barrel is very easy to load and the operation of the blaster is quite smooth. The handle grip is comfortable and has a mould/texture that tries to mimic that of a real pistol grip. Included are the ‘bug’s’ which are used as the targets for you to shot down. The bugs stick to the wall, window etc. and will slowly crawl/tumble down the wall. As the bugs fall down the wall you take aim and try to shoot them down. It is great fun and good target practice for the kids. The ‘bug’s’ have six legs, ending with sticky, bulbous feet. The feet will stick to almost anything, including the ceiling, window or even the fence. They work best on solid surfaces. With similar features as the Rapid Fire, but a smaller gun, the Predator 3 darts capacity is a rotating barrel that shoots in quick succession. This set includes a pretty cool bug launcher, where you launch it in the air and shot it mid-flight. The gun, has a side-loading magazine which is easy to use and load. The handle is large, comfortable and easy to grip. The included bug launcher is a battery-powered platform, designed to be triggered by foot. Pressing the button with your foot accelerates the motor, spinning the propeller. The bug and propeller spin up and of into the air. You then take aim and fire. It’s great fun. 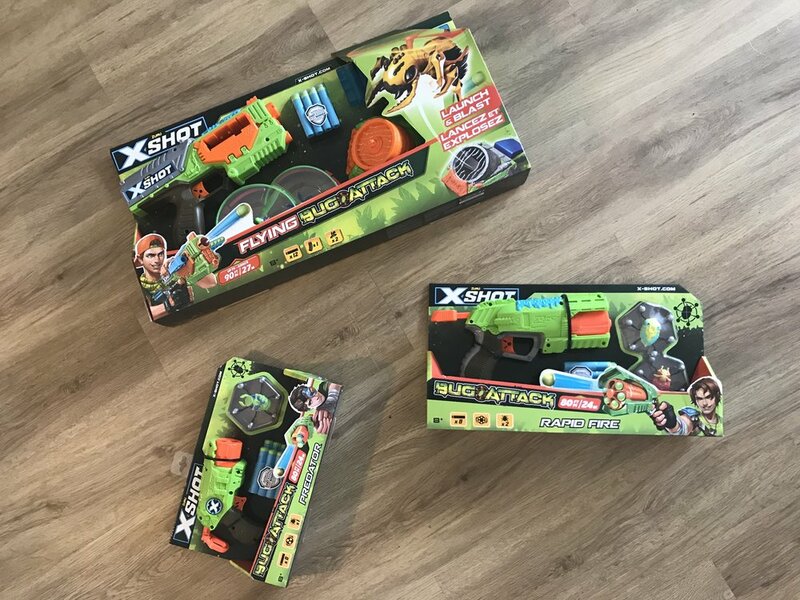 Jacob is very impressed with all three of the Zuru X-Shot guns, he loves the concept of having a moving target to shoot down, and enjoys using the different guns to practise this. These would make a great gift.